It appears no one has lost their faith in Sting, with close to 12,000 fans filling Sandalford Estate for the first show on the singer's national Symphonicity tour. The uber fit 59-year-old kicked off the concert with four of his biggest hits - 'If I Ever Lose My Faith In You', 'Every Little Thing She Does Is Magic', 'Englishman In New York' and 'Roxanne'. Although, the latter was barely recognisable. Slowed down and lushed up those old pleas of "Roxanne, you don't have to put on the red light", seemed to take on new meaning. Of course it is all part of Sting's plan for Symphonicity. The acclaimed tour sees the singer, born Gordon Sumner, "re-imagining" his classic hits and some lesser known songs for orchestral arrangement. 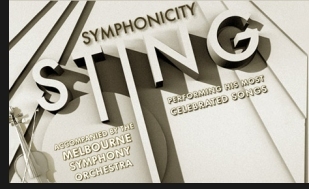 And while he didn't always succeed in his plan to add new colour and contrast to his songs, those that best utlised the sublime Melbourne Symphony Orchestra were standouts. "Russians" was possibly the most striking arrangement of the night. Conductor Steven Mercurio from London's The Royal Philharmonic Orchestra was a joy to watch as he theatrically flapped and twirled, rose and fell. It's little wonder Sting brought this famed conductor on the ride with him. Also along for the ride was Sting's long time guitarist Dominic Miller, bassist Ira Coleman, Rhani Krija and David Cossin on percussion and Adelaide singer Jo Lawry. The petite blonde, who has been part of the tour since the start, was a knockout on the duet Whenever I Say Your Name. Sting was clearly enjoying himself on his latest outing which comes on the back of his two previous visits - the first playing with the Police at NIB Stadium in early 2008 and the secound playing 16th Century lute music at the Concert Hall at the end of 2008. He danced, howled at the moon at the end of 'Moon Over Bourbon St' and even joined in some januty dancing with the rest of the band. "How wonderful to be back in Western Australia on a lovely balmy evening," he said. Later he would claim he almost could have been a Perth boy if his dad had followd his brother and emigrated to WA. He acknowledged his uncle and cousins in the crowd and said he wondered if his dad ever regretted not coming to Australia. "He told me 'when you leave school I want you to take to the sea' I think he wanted me to see the world and live an exciting life. I disappointed him," he quipped. "Eventually I did get my sea ticket, I was a singer on a cruise ship." The first half was rounded out by 'Fields of Gold' and early Police favourite 'Next To You', which brought things to a rocking end. The second half seemed to wane a little as Sting brought out his more obscure songs such as 'This Cowboy Song', ballad 'You Will Be My Ain True Love' from the film Cold Mountain and the tale of two foxes 'The End of the Game'. He introduced 'Tomorrow We'll See' by explaining that he'd at first tried to deny the voice of the male transsexual prostitute that arose when he was writing the lyrics, but the voice would not give in. "He said 'how dare you be so judgemental, you could be me in another life'". 'Moon Over Bourbon St' featured a costume change as Sting got theatrical in his dark tails. "Do you have vampires in Australia? They exist you know. One night I was walking in New Orleans, in the French Quarter and I had the distinct impression I was being followed..." he said by way of introduction. Mercurio was in his element too, all long backlit limbs draped in black working the orchestra into a sinister frenzy. The second half ended on a high with 'King of Pain' and 'Every Breath You Take'. Both had the audience on their feet dancing and singing along. 'Desert Rose' kicked off the encore and 'Fragile' was dedicated to "the people of Queensland and Victoria, some of whom have lost everything". It was a fitting tribute and follows the singer's announcement that he would be making a personal donation to the cause. However it was the surprise inclusion of 'Message In A Bottle' at the very end of the set that created a spine-tingling moment. As Sting stood on stage strumming his guitar, 12,000 voices liftted through the air: "I'm sending out an SOS". Magic.